True story: Sometime in 1999-2000 I took an Indian Airlines flight from Delhi to Lucknow for a day-trip. My return flight was around 5.30pm and passengers were boarded with a minor delay. When the aircraft was ready to leave the engine wouldn’t start. It was like a car that makes a whirring sound on ignition but wouldn’t start. We were offloaded and made to wait on the tarmac as two engineers came to the aircraft. They opened the cover of the left engine and did some minor checks and repairs. After a few minutes we were boarded again but the plane had the same problem and wouldn’t start. We were offloaded again and back came the engineers. They estimated it would take longer for the repairs so we were sent back to the terminal. We were served snacks while we waited and departure was announced again at around 9pm. We boarded the aircraft again but this time there was a new problem. You see, about a dozen passengers were quite worried about the engines so they refused to let the aircraft fly unless the engineers accompanied the flight. The arguments with the IA staff and crew lasted some 15 minutes till this group finally relented. The dozen passengers had finally relented because an elderly passenger intervened and asked them if they expected the engineers to go out and make repairs if the engines conked out mid-air at some 30000 feet. There are some good, bad and hilarious moments I’ve had in flights with IA and AI. We did reach Delhi safely without another engine failure. Since then IA has had Alliance Air, then changed the name to just “Indian” and finally all the branches are under one brand ‘Air India’ (AI). Some years prior AI was one of the best in international flights and as Indian my preferred choice but most travellers were aware the airline was going down the drain. 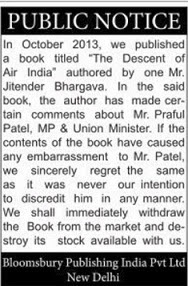 This is what brings me to a small review of the book “The descent of Air India” by its former executive director Jitender Bhargava (JB). I have often stated that Jawaharlal Nehru did not possess the foresight and vision for large country like ours. When he nationalised AI in 1953 he assured JRD Tata there would be no interference from the govt and he was true to his word. What he did not foresee is that his successors and other ministers would not stand by his word. Thus, one of India’s finest brands and world-renowned airline has been forced to take a dive. This is the story that JB tells us. The book may not exactly be exciting to read but is more like a documentary and mostly written as JB’s journey in his nearly 3-decade career with the airline. But it is a must read for anyone who wishes to acquire expertise on how to destroy a great business and a great brand. There’s the usual union problems; with Commie political parties backing them. There are stories of pilferage of premium Whisky and stuff by the pursers and cabin crew. Excessive compensation demands, allowances and appointment of people without expertise and so on. There’s even a hilarious idea of “Kerala massage” for passengers to improve their inflight experience. There’s a case where seats were chosen not by rational purchase procedures but only by celebrities trying those out at the AI office (like Shobha De). And yes, they had a variety of expertise on the board at times, including Jaya Bachchan of Bollywood. AI had also informally shifted its HQ from Mumbai to Delhi years ago but formalised it in February 2013. 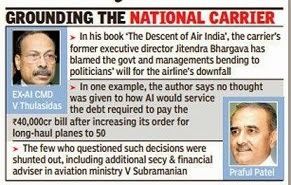 This is so that the chairmen could be close to the Civil Aviation ministry bosses and other political powers. I know, you must be wondering why all of these should be coming to you from a book when AI has been going downhill for many years. Well, I always say: The media is the first line of defence for the corrupt. This may not entirely relate to corruption but since media too was scavenging on a dying airline many stories may not have come out in the open. As the airline’s performance careened to new lows year after year, none could stay immune to the impending catastrophe. Even Mr Thulasidas was perturbed. Instead of tacking the problems at hand with research and rationale, however, he decided to invoke the power of ‘vaastu’. An expert… from Hyderabad was appointed to guide the chairman on which angle to place his desk, where to conduct his meetings with colleagues and which doors to the conference room to keep shut or open. The changes suggested by the experts were duly carried out at substantial expense to the airline… Another example of how Mr Thulasidas prioritised his personal preferences was his insistence on being escorted to and back from work every day of his tenure. An AI employee would pick him up from his house every morning and drop him back at his house every evening. And in the mornings, as Mr Thulasidas’s car approached the AI building, the aide would call a peon at the office and ask him to hold the elevator door open. Okay, that’s hilarious but not all CMDs are described like that. JB goes on to describe how intolerant of dissent the leaders at AI had become between 2004 and 2008. 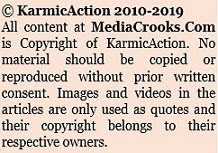 As with other PSUs given below are cases where largesse was being doled out to media houses for no reason or rhyme. JB reads it as “barter” for publicity but even he judges it wrongly. For example, when a reputed media house was hosting its annual summit, _____ _____ extended AI’s patronage to the event without consulting the chairman. 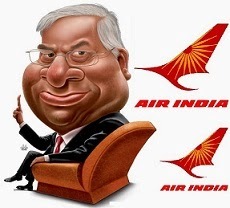 He committed the airline to 30 lakh worth of tickets by way of a barter deal in lieu of publicity for AI. When the organisers sought tickets as part of the deal, we discovered that there was no written approval or sanction for the barter arrangement. No one had any knowledge of the verbal agreement either, but it had to be honoured since the minister had already given his word. It was the same story when it came to organising familiarisation trips for the media at the time of a new flight launch or some such affair. The minister’s office would send a list of journalists to be invited… some of these ‘journalists’ never wrote a line after their return. But our views were not taken into consideration, not even when it could have both saved the airline a substantial amount of money and ensured better publicity. In 2007, when India won the T20 cricket championship, AI was forced to release full-page advertisement in the newspapers on the specious plea that we should celebrate as almost half the victorious team was on the rolls of AI. The advertisements cost the airline 3.50 crores – this at a time when the airline was financially bleeding. Professional cricketers with lucrative contracts with BCCI were also on AI rolls? Nice! Cricket is as much a political tool for many politicians as are the glamorous PSUs like AI. Now, what JB refers to as “publicity” is not publicity at all. Publicity could be in the form of some favourable article (even notified as sponsored) or some write-ups that talk about the airlines services or major achievements etc. JB doesn’t indicate any such return for the expense. 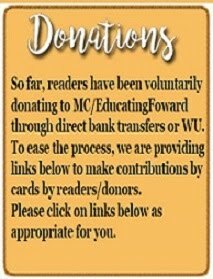 He calls it barter purely because no cash was paid; it was just plain “sponsorship” or an “advertising dole” with nothing measureable gained in return. Since advertising budgets had always been low, the airline has chosen its media basket with caution. But at the behest of a few people in power, AI, AAI and IA were forced to release every campaign, irrespective of whether it was relevant to the newspaper’s readers or not, in a publication owned by a powerful media magnate. Even by the most conservative estimate, advertisements worth over 10 Crore were issued to the said media house. Over the years, the politicians have become more demanding. They interact directly with the chairmen, in whose appointment they are likely to have played a role. During 1993-94, when Ghulam Nabi Azad was the minister of civil aviation, Russy Mody, as chairman of AI, summed up the environment well when he publicly stated, “I want to be azad, and he wants me to be his Ghulam”. In sporting terms “taking a dive” simply means deliberately losing a match or a bout to a competitor with or without any consideration. In Cricket we are familiar with the term “match-fixing”. AI has been forced to take a dive for many years. It may be too late to save the airline unless govt is removed from the management. It remains to be seen whether our media will take the trouble of looking into other PSUs who generously bail them out. I’m not betting on it. Beautiful review of the book. It was as good as reading the book itself. I always think that AI cannot even be a good case study for MBA grads as there was more political problem than management problem. Of course, it can take that angle of politico-management case which might be useful to handle other PSUs from following the same path of doom. Thanks Ravinar sir. I read about JRD's initial mail service flights to Karachi, which he used to pilot himself of course. Air India was his favourite as he thought he understood flying very well...the rest in his empire, he left in other capable hands. It is sad to see what the Commies have done to that airline. Thanks Ravinar, for writing about AI and it's murder. wow what a lovely read and an eyeopener. Thank you very much Guru Krupa for sharing! Peon holds the elevator door open, sometimes for 30 min, for big boss of Press Trust of India (PTI) in their office in Delhi. Government resources is considered pocket borough of Babus. Complained on their twitter page, not that I expected any response. This VIP culture has seeped into bone marrow of these babus. To hell with the solemn duty of the government to work for the betterment of the citizens.. It was once said that u can set your watch according to AIR INDIA flights.. This is the same story with all PSU's. Many have sunk without a trace or are on the verge of extinction. Vis mtnl, hmt, fact and many many more. The root cause is incompetence ( of politicians and bureaucrats ) in running business, reservations ( that destroy, denigrate competence ), nepotism , corruption. The same has happened to even doordarshan. These were all made to 'take dive' ( self capitulate ) to make way for private sector . This is indeed the worst type of crony capitalism and it has been practiced and perfected jn India in the last 65 years. Mtnl and bsnl have been destroyed simply to ensure business of the private players . India is perhaps the only country where the government owned telecom company has been reduced to irrelevance . I did try to fight this battle out for a few years , but the bureaucratic and regulatory incompetence in this country is appalling . India is inching towards a very slow painful death . Although I was reading your blogs for last 3 months, I am commenting for first time. I am currently ( coincidently) reading biography of JRD Tata in Marathi. In it there was an incident mentioned about publicity to new planes purchased by AI. The babus in the ministry wanted to carry some journalists aboard the new plane free of cost, ( cost to AI though) and how JRD strongly and successfully turned down that ''idea''. But somehow, Mr. Hathising, brother in law ( oh! Not again!) of Pandit Nehru was allowed a free ride aboard the flight. Histroy repeats itself, but alas! Men of JRD's stature are not in AI now. There is another mention about the punctuality of AI flights in JRD's time. People in Zurich would tell the time as 11 am when AI flight would land there or the clocks adjusted accordingly. Gone are the days! ? Now what remains is chaaplusi to the core.Many thanks to ministry babus and ministers for destroying a world class, competent, profitable airline which JRD created and nurtured like his own baby, Thanks again ! Thanks Mr. Ravinar as always for an eye opening article. One more querry, is that book available now in market/ libraries etc? Or for that also, we have to wait for new govt? I think the commies fancy PSU bcz of the electoral dividends that it provides by way of labour class vote banks at govt expense.PSUs being what they are,no employee is under any pressure to perform and offers the best job security as well. So a whole generation of voters and their families will ever be beholden to these handlers.If at all any PSU has to succeed, it is only through monopoly. The SEBs for instance.What more can an employee ask for, than go to his work if he feels like, spend time there and get paid.When the PSUs dont deliver what they should, the netas will divert the jobs to their own benami sub contractors.Beyond that the politician have an organisation to park their good for nothing sidekicks.I think the Commie parties downward graph started after Govts started disinvestments in PSU.The faster this task is completed, the better for the nations future. I have specifically requested again a few posts back to keep comments restricted to the topic of the post. Your comment pertaining to Telengana-Rayalseema and related politics has nothing to do with the post. Please keep comments relevant to the post. Any book that incriminates a political party or leader is always banned. A drama based on Nathuram godse's is still banned. The book "polyestrr prince " on mukesh ambani is banned in india but available abroad. If we dont know history, we are doomed to repeat our mistakes. In aviation industry the worst battle is often cconsiderdd as the one between virgin and british aireays. This one between air india and others is the murkiest. Another hidden agenda must be weaken the AI means strengthen the private airways. If one look at this aspect carefully then find out that Indigo rise is happening in last 10 years. And Indigo owner is close to the bosses of Delhi. So AI remains a entertainment tool for the govt and coterie at the expense of public exchequer. This book must be available to all and we must find out ways and means to make it happen. Thanks for highlighting this LOOT by some CROOKS whom we know as otherwise as ministers and corporate honchos.